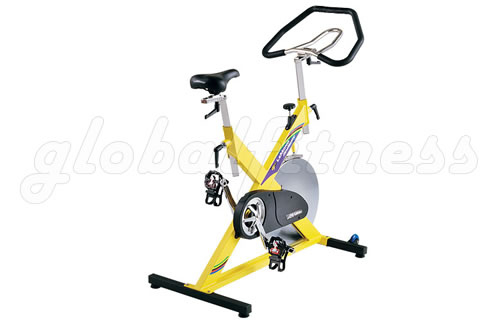 The classic LeMond® RevMaster® offers superior strength and durability along with quick and easy-to-use features. You can't go wrong with the handsome, X-shaped frame, which was built to accommodate the widest range of users. Hop on, and you won't waste any time making the necessary adjustments (seat, handlebars, etc. ), because the RevMaster cams were created to make it easy for users to find the right fit for their bodies. And those cam adjustments come equipped with steel reinforcements, so the RevMaster won't wilt underneath you when you confront the hills. Other features include a 47 lb precision-machined, chrome plated flywheel, cast stainless steel cranks, turn-knob design for tension, and optional custom pedals, which permit riders to rotate between traditional "toe-clip" designs and clipless "SPD"-designed pedals that allow the rider to become part of the bike. Either way, you get the ability to push and pull, targeting more muscle groups. Track all your efforts with the optional RevMaster Pilot, a stylish, easy-to-use cadence meter mounted conveniently on the handlebar in front of you. Dimensions: 41.5" X 22" X 38"
Seat Adjustment Range: 23" - 34"